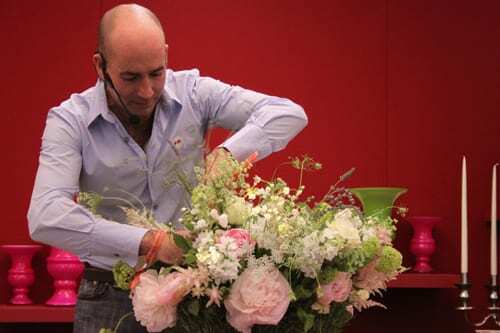 Following on from yesterday’s floristry demonstration by Simon Lycett, today I’m featuring Mathew Dickinson‘s arrangements at the RHS Chelsea Flower Show last week. Mathew made four arrangements including the beautiful spring rosemary bowl above. And below are details of the stages involved. 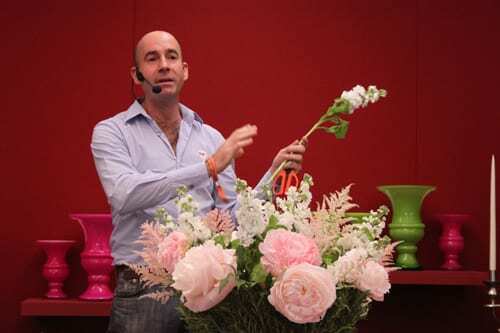 He started off with a plastic bowl with chicken wire, which he then placed inside a rosemary-covered bowl. 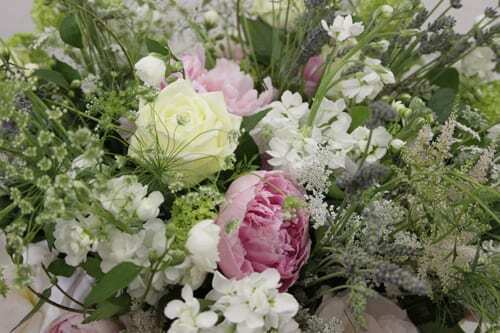 Baby pink peonies were inserted into the chicken wire, followed by astilbe. White stocks, more peonies, guelder rose, white roses, dill, philadelphus and lavender were then added…a perfect centerpiece for a wedding! 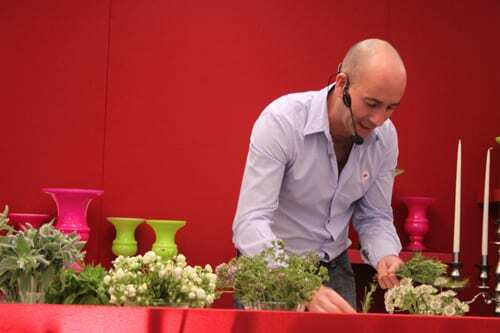 For the next arrangement, Mathew placed herbs and flowers in a selection of vintage vases, jugs and glasses…a look which is very ‘in’ at the moment. 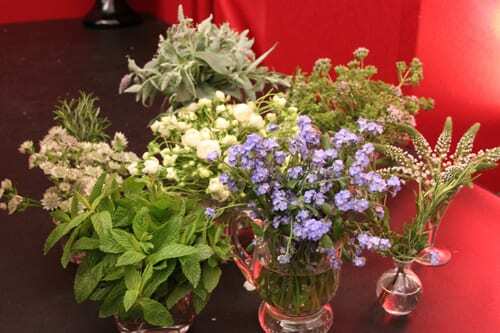 He arranged groups of forget-me-nots, mint, grey leaf mint, majoram, small white spray roses, astrantia, rosemary and lysimachia in individual containers. 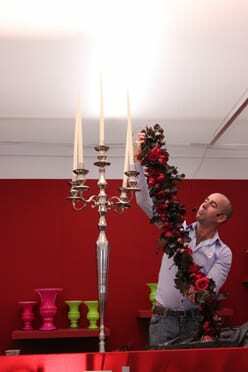 Mathew also showed us how he decorates candelabras for events with a garland that he’d prepared earlier. 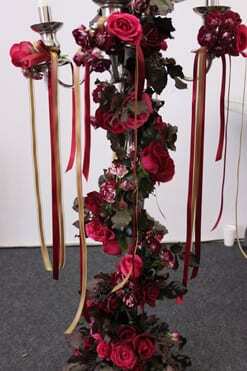 It consisted of beech leaves, roses, alliums and spray roses..and what beautiful rich colours! 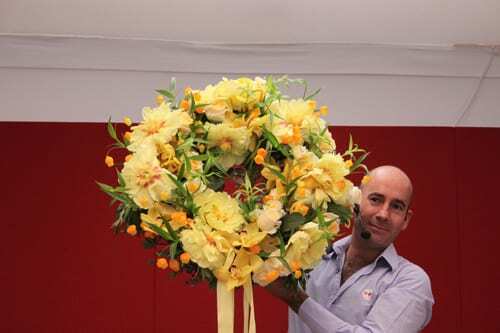 The final arrangement is a stunning floral wreath which Mathew created in floral foam. 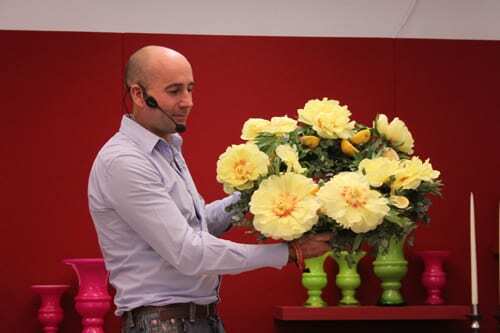 After it had been greened up with eucalyptus, he attached lemon halves and inserted yellow peonies. Then he added roses, cymbidium orchids, sandersonia (one of his favourite flowers which I’d never seen before) and a ribbon. 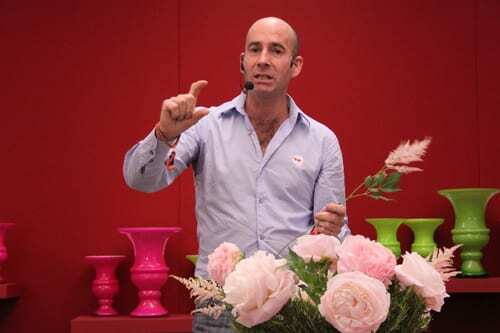 I hope you’ve enjoyed seeing his arrangements and please tune in tomorrow for the floristry demonstration by Rebel Rebel.